The negotiations for the next Collective Bargaining Agreement (CBA) will feature considerable back-and-forth between the players’ union and the league’s various ownership groups. This is only natural: those are the two parties which must ultimately agree upon the terms of a new deal. But it’s also not an entirely aimless point to make, because those negotiations won’t be the only ones taking place. The owners themselves could have some fairly contentious discussions in deciding their own strategy, particularly when it comes to sharing revenue among the teams. 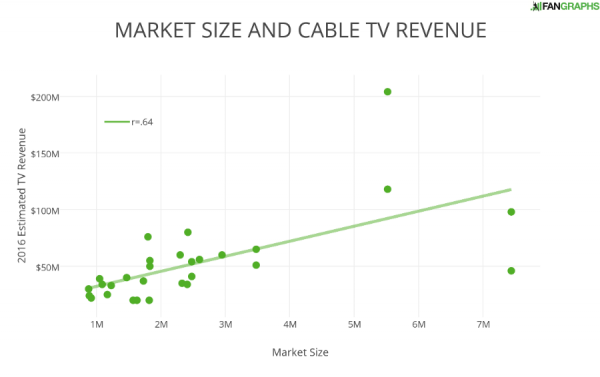 Big-market teams have long gained an advantage on revenues at the gate, but increasingly, the advantage has come from television revenue from local cable networks. Teams continue to sign billion-dollar deals that include an ownership stake, and determining how to divide that money could prove difficult. Over the last few years, the Arizona Diamondbacks, Philadelphia Phillies, and St. Louis Cardinals have all agreed to new long-term local television deals with Regional Sports Networks (RSNs). It has been a few years at FanGraphs since Wendy Thurm documented the local cable television deals for all MLB teams, and this post aims to provide an update. The work she did helped inform this post as well as a few others to provide a base for research. When we hear about television deals, we often think of them in terms of the average annual value they provide. That’s a familiar term in baseball, as most player contracts are structured to be paid evenly over the course of the contract. That practice is less common under other circumstances, however, with deals often paying a smaller sum at the beginning of a contract and increasing over time. Television contracts are often structured in this second way. To account for that practice, I have estimated 2016 television money by assuming a yearly 4% increase in money paid to teams in order to find a (hopefully) realistic estimate for how much teams are receiving this year. For example, the Phillies currently possess a 25-year, $2.5 billion dollar deal that begins this year. Instead of assuming they will receive $100 million every year, I am assuming they will receive around $60 million this year with 4% yearly increases over the course of the contract. There is a full chart below with all the relevant information, but let’s focus on 2016 money first in the graph below. I did my best to include only contracted revenue — i.e. 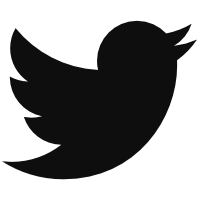 to omit revenue generated from an ownership stake in a network. However, due to the lack of publicly available information, it’s best to regard these numbers as estimates. Note that, particularly with respect to the Chicago teams, as well as the Los Angeles Angels and Boston Red Sox, that the revenue estimates actually might include money from network ownership. It was difficult to parse those figures. If the graph above leads one to believe that big-market teams are reaping most of the benefits while the small-market teams are left with a relative pittance, that view is supported by market information. The graph below shows the estimated 2016 local television revenue along with the number of households in a team’s market. Given the number of other variables — like how long ago a team signed its contract, the team’s popularity, its regional appeal, and its ratings — a correlation coefficient of .64 is fairly strong. Especially for the simplicity of the categories utilized on the axes — that is, merely the number of households in the principal market and the 2016 television revenue estimates. Teams and networks make their money on getting their broadcasts to appear within the standard cable lineup and charging a per-subscriber fee, and the result is that more homes means more money to give to teams. And that’s the not only big-market advantage. The Toronto Blue Jays present an interesting case. They weren’t included in the graphs above. Several years ago, the Blue Jays received $36 million from their RSN, but it’s difficult to accurately discern how much they’ve received over the past few years. The Blue Jays are owned by Rogers, which entity also owns Sportsnet, the channel on which the Blue Jays appear throughout Canada. The Blue Jays are likely only receiving a portion of the television money while the rest stays with the parent company. 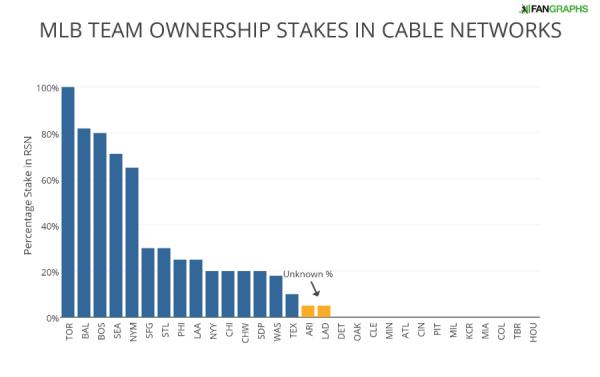 For the most part, the teams receiving an ownership share of the network are in the big markets. Only the San Diego Padres, and maybe the St. Louis Cardinals, are located in what would be considered a small market. The Cardinals might be in a small-market television-wise; they operate on a larger scale, however, due to attendance. Their deal with the ownership stake does not begin until the 2018 season. The ownership shares are incredibly important when it comes to revenue-sharing because any money gained as an owner of a network is shielded from revenue-sharing, as are the figures that MLB has provided when calculating the players’ share of revenue. The losses are not considered as well, which likely hurts the Astros, who struggled to get paid by Comcast on their deal, which is now with DIRECTV through ROOT SPORTS. This shielding of revenue is also where the dispute between the Baltimore Orioles and the Washington Nationals is relevant. The Orioles own a much bigger share of MASN than the Nationals, so every dollar that does not go towards the Nationals’ rights fees gets paid in a disproportionate share to the Orioles. The Yankees used to have a much higher share of the YES Network, but have sold off most of it to FOX over the past few years for roughly $2 billion. It’s no surprise, then, that the Yankees are voicing their displeasure about revenue-sharing given that much of their revenue used to be sheltered from the rest of MLB through the network, but those sheltered revenues have been decreasing. In all, MLB teams are receiving an estimated $1.5 billion on their local cable deals without considering ownership interests. The chart below shows the 2016 estimates, the total deal, if known, the start and end of the deal, the ownership stake, and a link with more information. 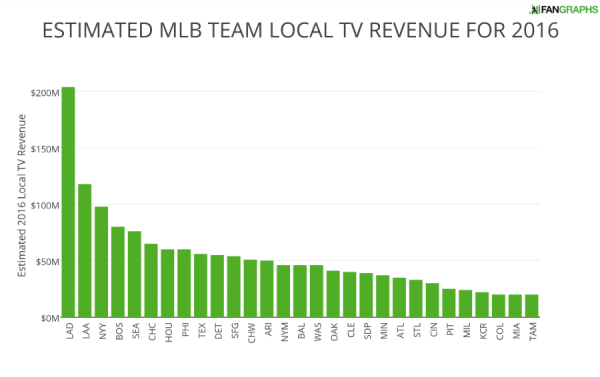 We hoped you liked reading Estimated TV Revenues for All 30 MLB Teams by Craig Edwards! You guys should learn how to abbreviate “Tampa Bay” better. Kansas City is KCR. New York is NYY and NYM. San Francisco is SFG. San Diego is SDP. Yet, for some reason, Tampa Bay is TAM. When you guys write Tampa, or abbreviate Tampa Bay as “TAM”, I will just assume you are referring to the Tampa Yankees. Let me know when you are referring to the Rays. I’m anticipating some consternation when the Smyrna Braves begin play next season. You must learn how to shorten the “Tampa Bay”. Kansas City is the KCR. NIM NII York. San Francisco SFG. San Diego is the PDS. However, for some reason, Tampa Bay TAM. When you write Tampa or Tampa Bay cut as “TAM” I think it will go only to the Yankees in Tampa. Tell me when you talk to the rays. Thumbing me down? I’ve read articles here about swinging strike percentages changing 1%. I don’t think it’s asking too much for the writers to know which city all 30 baseball teams are located in. Start referring to Los Angeles as Los, San Francisico as San, New York as New, Kansas City as Kansas, and Saint Louis as Saint, if you are going to constantly refer to Tampa Bay as Tampa. People are thumbing you down because this is just the pissiest of pissant complaints. You obviously know what team they’re referring to; we all know what team they’re referring to. And yet you feel the need to register your disdain about something that has zero (0) impact on the substance of the article. Absolutely none whatsoever. Not asked in a nice way, mind you, but whiny internet tough guy mode. First comment too, this pissant complaint not only had to be said, but fast! This may help you better understand why you are getting down votes. Happy to help. Not to mention, if we’re going to be Super-Ultra-Pedantic(tm), Tampa Bay is a body of water. Tampa is indeed the city in which the Rays are located. Not a single damn writer here knows what city the Rays are located in. To be fair, the team itself seems not to know. Maybe that’s why there’s no fans there; they can’t find it. While the complaint is a trivial, it is true that TAM isn’t a good abbreviation of Tampa Bay. TBR would be better. Or just TB. But apparently all the abbreviations have to be 3 letters now. In all honestly – are you getting them mixed up with another team? Is there even a moment’s confusion as to what team TAM refers to? Honestly curious. People are thumbing you down because you are being kind of a condescending jerk about a nitpick that isn’t even necessarily an error, and you don’t even really seem to grasp the point you are trying to make. It doesn’t help that it was the first comment posted and has nothing to do with the discussion. Firstly, the charts above use several nonstandard abbreviations, and they aren’t even consistent between the two charts. One uses TAM while the other uses TBR, one says CHI and the other says CHC, etc. There is no reason to single out the use of “TAM” as such a huge deal and extrapolate that the author doesn’t know what city a team represents. Secondly, do you even know what city the Rays play for? The team is named after a body of water. It’s not like there is a municipality called “Tampa Bay” so you can’t say “Tampa” is the wrong city. The team represents all of the Tampa Bay of which Tampa is the largest city. While referring to the team as such might be imprecise and informal, team names are imprecise anyway, and one could just as easily be using “Tampa” as a shortened version of area itself or the team name. Thirdly, and most importantly, is that there is no hard and fast rule about team name abbreviations or team names themselves. Different networks and sources vary on the abbreviations used (CHW vs CWS for example), and there isn’t any consistent formula for an abbreviation that you seem to think there is. KC, WSH, and STL could just as easily be KAN, WAS, and SL. Heck, in your own example you mention St. Louis, but by the convention you seem to think exists it should be SLC. STL and TAM are constructed the same way. And as I said, team names are frequently imprecise anyway. It’s not “represented municipality + mascot”. The Yankees aren’t called the “New York City Yankees” even though that is the actual name of the city they represent. The Rangers don’t represent the whole state of Texas, but it makes for a good team name since a Texas Ranger is a real life thing and a DFW Metropolitan Area Ranger is not a thing. The Minneapolis-Saint Paul team has the cities in the second part of its name: the Twins. And the Golden State Warriors break all conventions by being named after the NICKNAME of the state where the San Francisco Bay area is (despite sharing the state with three other NBA teams). That was way longer than I meant to go, but I feel like I should be thorough in explaining why you are getting voted down and why you sound so ridiculous talking down at the writers here. You want to read about Bruce Harper? Mark Trout? San Francisco Athletics? The Yellow Sox? Tampa doesn’t have a baseball team. Tampa accounts for for very, very little of the Tampa Bay region. The Tampa Bay region has 4 counties, and 4,310,524 people. Tampa has a population of 346,000. This is a math site, right? What percentage of 4 and a half million people is 346,000? Stop calling it effing Tampa. It’s not! a) I have never seen anyone on this site refer to the Tampa Bay region as “Tampa”. I have seen uses of “Tampa”, “Tampa Bay”, and “the Rays” all used as a short form of “the Tampa Bay Rays”. I’m sorry if this confuses you or defies your personal rules for referring to teams, but it seems pretty clear to everyone else. When someone says a player plays for Corpus, I know it means the Corpus Christi Hooks. When someone calls a team “Francisco”, I know they are talking the Giants and not an imaginary team from Francisco, Indiana. Feel free to correct someone next time they say the Rays have a game in Tampa if you feel that is misleading, but keep in mind saying that a game is in Tampa Bay is just as wrong. b)Again, the word “Tampa” isn’t even in this article. I don’t know what you’re crying about. One chart uses an abbreviation using “TAM”, the first three letters of the team name (does the same thing with “CHI”, which a certain fan base might actually find offensive), and then another abbreviates it “TBR” using letters from every word of the team name (similarly with “CHC” in the same chart). How do you not see that you are being crazy? What manner of abject dumbassery is this?! Do they play in Tampa proper? They do not. However, are they known as Tampa (or Tampa Bay) by every single website, writer, sportscaster, newspaper, and commenter? They are. Can you cite examples of where people are commonly calling them the St. Pete Rays? Anyone at all? Even a single credible example? No? OK.
You must find more appropriate hills to die upon. Yes. This hardly deserves 1 comment, much less 20, but I can’t refrain from confirming your point that he didn’t mention TOR, BAL, BOS, SEA, STL, PHI, CHI, WAS, TEX, ARI, DET, OAK, CLE, MIN, ATL, CIN, PIT, MIL, MIA, COL, or HOU as an issue. Greetings from New York, New York. Very late to the party here, but as a native New Yorker I have to tell you that the name of the city is New York. New York City and NYC are commonly used (as are New York State and NYS), especially to disambiguate, but we are the City of New York as Boston is the City of Boston and Chicago is the City of Chicago, and so on. We are not New York City like Kansas City or Oklahoma City. Trying to navigate through the swill is why I don’t often even bother trying to read the comments section. This was your take away from the article?